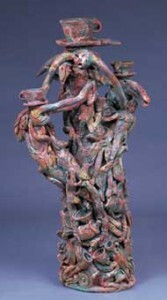 Clay is the oldest and most natural medium for sculpture. You can form large pieces one coil at a time, construct pieces with slabs, stack forms into totems, or now even create something digitally and “print” it. In Ceramic Sculpture, clay artists reveal their techniques and their inspiration for creative sculptural works. 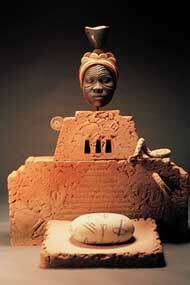 Some of the work is monumental, some intimate, some site specific, but all of it influenced by clay. With each artist providing some aspect of the sculptural process from conceptualization to forming and finishing to the final installation, you’ll find the range of ideas and techniques informative and inspiring. Have you ever wondered what it would be like to just travel around to different artists studios to drop in and see what they’re up to? Many artists are open to the idea, but they’re spread all over the place. 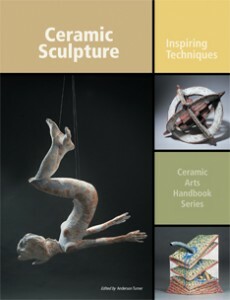 In Ceramic Sculpture: Inspiring Ideas you’ll enjoy “touring” the country (and even the world) dropping in on artists where they tell their stories, explain their techniques and show examples of their work. For many people, there’s a conflict between the world of high tech and the fine arts but Linda Mau realizes that everyone just wants to be creative. In her “Mathematics as Metaphor” series, she creates geometric forms from Paper Clay and Steel to produce striking forms. 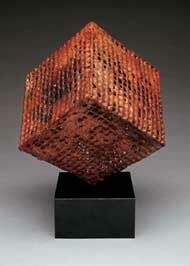 Marcia Selsor enjoys creating architectural elements and forms. Working with slabs at such a scale makes it necessary to control angles and shapes, so her Right Angle Jig does the trick. The jig supports slabs while joining the edges, and is an invaluable tool when building architectural forms. 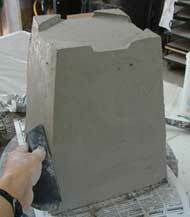 One of the challenges of working with clay is timing, especially when constructing a complex sculptural form. Mark Gordon has adapted a technique for his ceramic sculpture used by Egyptian brick makers. 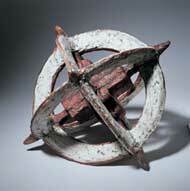 This Mortar Construction is a simple way to securely attach bone-dry greenware to bone-dry greenware.